In the wake of the Armistice that put an end to the First World War, individuals as well as nations were trying to find their bearings again. So were hotel owners, who started reopening to an uncertain demand, and graphic artists who were once again called to design promotional paper items. Art Nouveau, a somewhat tiresome and often over-decorated style, had started to subside soon after its triumph in the 1900 Paris Universal Exhibition. By 1905 Paris was over with it, and the rest of the world soon followed. But not all trends that fitted under the broad umbrella of Art Nouveau were curvaceous or over-decorated. The so-called "Glasgow Four" in Scotland, the Austrian members of the Wiener Werkstätte, and others took inspiration in such sources as the minimalist classical Japanese interiors and the clean aesthetic of machine-made products to advocate the design based on tall, rectilinear forms and sharply defined angles. The Japanese label above dates from circa 1910 and illustrates the fine classical Japanese graphic style that was emulated in the West. The demise of Art Nouveau had seen, for some, a fallback to the old graphic solutions and for others a quest for new aesthetics. This would eventually lead to a new global style called Style Moderne in its heyday and known today as Art Deco (or simply "Deco"), a name coined in the 1960s after the Exposition des Arts Decoratifs that was held in Paris in 1925. Graphically, Art Deco is characterized by an emphasis on striking geometric shapes and patterns, often in bright contrasting colors, and rectilinear typefaces with clearly defined angles. Although the style only became truly international after the 1925 exhibition, it had been brewing for many years and there are designs clearly identifiable as deco datable to before 1920. 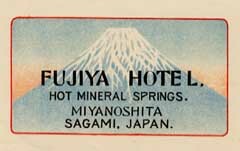 In hotel labels, the post-WW I period had been a time of reuse of old design solutions (and often reissue of unchanged designs from prewar times). There were still marvelous labels, but nothing really novel that could match the revolution of the early 1900s... then came Deco, originating a string of stupendous new designs and a rekindling of the Golden Age. Beholding those labels today, one feels surprised that, once, so much talent was routinely lavished on such small and seemingly unimportant pieces of graphic work. 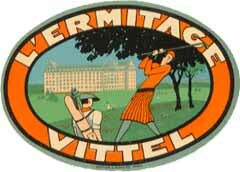 The label above, for a Palace-Hotel in the French spa of Vittel illustrates some of the main traits of the fine French deco: bold colors, elongated figures and angled shapes. The lettering (characteristically made of non-seriffed angled fonts) was an essential part of the design. 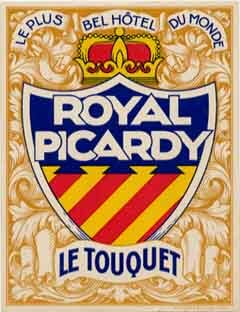 France, that had neither lead, nor been lead during the First Golden Age, now dictated the trends and produced some of the best labels ever to grace a traveler's luggage. Switzerland barely managed to hold its ground in innovative graphics thanks, mostly, to the designs of Brügger's artists. Italy, on the other side, was again a source of great decorative originality, but Richter & Co was no longer its motor. Mario Borgoni was aging and never really caught with the new style (the fine label at right is a rare attempt at deco-inspired design). He was still Richter's artistic director and probably imposed his own by then conservative standards to others. J. Paschal still designed labels but he too seems to have lost the gaiety of twenty years before. Surely not all clients were delighted with the new trends, anyway, and that may have justified Borgoni. He would leave Richter in 1930, perhaps as a result of the dwindling demand that followed the 1929 Wall Street crash that would almost lead the luxury hotel business to extinction. As Richter's entry into the label printing business in 1900 had conveniently marked the beginning of the Golden Age of Hotel Labels, so may Borgoni's year of departure conveniently mark its finale! Mario Borgoni's departure was not, of course, the reason for the ending of an era; the Wall Street crash of October 1929 was! It came at the end of the month, when the European hotels were already open for the winter season in a clime of prevailing optimism. Rooms were sold out in advance and the recession did not start to really hurt the business until 1930, when the trouble deepened. Then it became clear that what was happening in the USA was not a short term local disruption and its consequences spread throughout the world. Investment in luxury hotels had been considered safe and prompt in bringing sizable returns but now the developed countries sunk into a deepening economic recession, from which no recovery was in sight. The tale of the unfortunate Royal Picardy illustrates the fate of untimely investments in the field. The hotel opened in the spring of 1929 at the French Atlantic resort of Le Touquet. Its target was the wealth of Britain and no expense was spared to entice it. It opened with 500 rooms and was deemed "Le plus bel hôtel du monde" (The most beautiful hotel in the world). One year later the company was on the verge of bankruptcy. Eventually the hotel was remodeled and opened with only 60 rooms... (the agony finally ended in 1970 when the once proud building was demolished). The French luxury hôtellerie was possibly hit the hardest by the recession. The heights of Cimiez, above Nice, held one of the largest concentration of luxury hotels in the Cote d'Azur. Its crown was the peerless Regina, once patronized by Queen Victoria herself and one of the largest and most luxurious hotels in the world. In 1934 the owning society was bankrupt. A few months later the wine cellar and furniture were auctioned. In 1937 the hotel was transformed into a condominium. Its long and graceful building still gazes sadly towards Nice. Its neighbors (the Majestic, the Alhambra, the Riviera and the Winter-Palace) suffered the same fate during the 1930s. 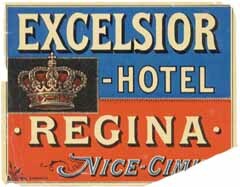 Of the fabled French palace-hotels of Menton, Grasse, Aix-les-Bains or Vichy none remains today! During the 1930s the palace-hotel owners that still resisted could no longer spend lavishly in paper items that would mark their difference. Now they had to count their pennies and consequently labels tended to be cheap and were cheaply printed, frequently bad copies of older designs. New labels were often somber, as if prophesying the war that was soon to come. In 1936 French workers were allowed paid summer vacations for the first time. Other countries soon followed. The tourism business took off again but the demand was now for cheap lodgings, not expensive ones. 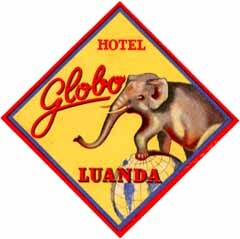 Yet, the new breed of travelers also fancied to emblazon their luggage… By then, all hotel owners had realized that there was promotion potential in having the name of their hotels on the luggage of customers and after WW2 labels would be produced in a number and variety never seen before. 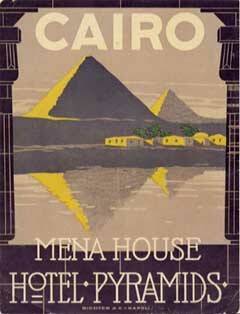 Every hotel and boarding house had its own label, often in sets of different colors. Some of these designs are interesting for their naïveté (see label at right). 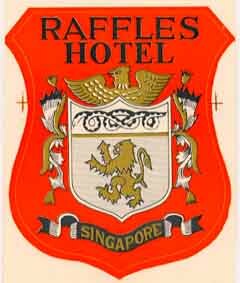 There were still some good artistic designs, particularly for hotels in faraway places, visited by a more exclusive élite, but these were rare and getting rarer. Expensive printers serving the hotel industry had, meanwhile, diversified or disappeared. By the early 1950s even Richter was gone, after producing some postwar editions, often based on photographs, that in no way hinted to its former grandeur. The vulgarization of air travel during the 1970s finally brought the production of hotel labels to a halt: the rough handling of luggage that characterizes mass travel by air meant that labels would be all but destroyed after only a few flights. Nowadays, a few hotels still offer self-adhesive stickers to their customers, but the designs cannot compare with their illustrious predecessors. The age of the hotel label is a thing of the past but, with time, these small rectangles and circles of colored paper came to represent an era. They irresistibly summon nostalgic feelings for times most of us never knew but, somehow, would like to have experienced.